Peoria boasts 160,000 residents, who in a 2013 Citizen Survey, 98 percent Peoria residents said they would recommend living in Peoria to anyone who asks! To regular vacationers and smart home buyers, Peoria has long been one of the most desirable locations in the Grand Canyon State. Located in the Peoria 83 (P83) Entertainment District, Arizona Broadway Theatre is a professional fine dining theater performing highly acclaimed Broadway shows. The Center for the Performing Arts is located in the City’s Old Town area and is the stage home of Theater Works, a nationally recognized community theater. Peoria is ideally located for the sport and recreation enthusiast. Each spring, the Peoria Sports Complex becomes the spring training home to the San Diego Padres and the Seattle Mariners. There are four spring training sites within 10-miles of Peoria, so catching a Cactus League Spring Training game is easy. If you are a fan of the NBA, MLB, NFL, NHL, NASCAR or major college sports, Peoria puts you minutes away from seeing your favorite team or driver. 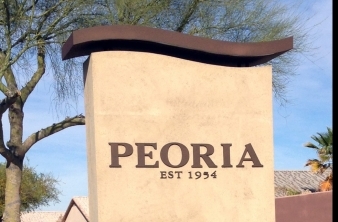 If you like playing in a park, then Peoria is the place for you! Peoria offers two regionally recognized community parks and 33 neighborhood parks. Rio Vista Recreation Center and Park is a 52-acre park in the heart of Peoria that boasts an urban fishing lake, top notch skate park, volleyball and softball fields, batting cages, ramadas, and a state of the art recreation facility. In the southern part of the city is Pioneer Community Park, an 84-acre facility with athletic fields, 5-acre fishing lake, and a dog park. Looking to get out and stretch the legs? Peoria has over 25 miles of trails to enjoy. Hike, bike or jog along the New River Trail, or go explore the surrounding desert and see incredible vistas and areas where ancient civilizations once lived. Peoria offers a unique desert and water experience. Lake Pleasant and Lake Pleasant Regional Park is located in north Peoria. With more than 10,000 acres of water and 13,600 acres of land, this popular attraction is the perfect place for water sports, desert camping, hiking and wildlife watching. With its beautiful vistas, great schools, outstanding communities and recreational opportunities, you can see why so many people recommend Peoria’s quality of life for their family. Click Community Below for Report. *Some of reports on this website may not be applicable in the state of Arizona; please ask us or your real estate professional for clarification on any questions.